A Chromebook can be described as a new breed of Laptop computers that run on Google’s Chrome OS and work at their best when connected to Google’s Cloud based infrastructure via an internet connection. These machines boot up lightning fast (within 8 seconds) and excel in connecting users to the internet as quickly and efficiently as possible. Once connected to the internet, you will be basically performing all your tasks on Google’s Cloud storage service called Google Drive. 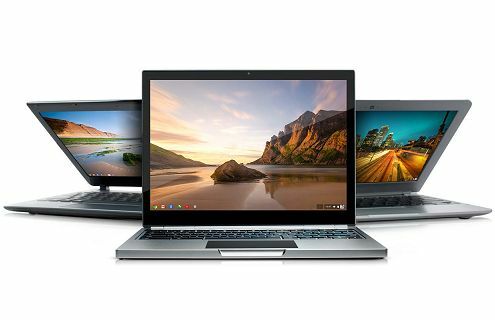 Chromebooks are essentially designed to connect users to Google’s cloud service, which is where all the computing and storage takes place. Hence, it is not difficult to design Chromebooks as lean and efficient machines. Unlike traditional laptops, there is no need to provide the hardware to support large storage and on device processing of software programs and data in Chromebooks. Screen Size: Chromebooks are available in 11.6-inch, 13, 14, and 15-inch sizes. High quality resolution is not yet common in Chromebooks, but that is changing with HD screen Chromebooks hitting the market at reasonable price points. Storage: Most Chromebooks ship with 16GB of SSD storage, there are also models available with 32GB SSD storage and option for expandable storage using SD cards. While you can add more storage via USB drives and memory sticks, you need to get comfortable with the idea of storing files on Google Drive. Google provides Chromebook buyers of all brands with 100GB of Cloud Storage on Google Drive free for the first 2 years. RAM: Currently most Chromebooks come with 2 GB of RAM. However, that is changing with 4GB RAM models becoming available at reasonable prices. Processor: Compared to regular computers, Chromebooks ship with rather under powered processors, just good enough to handle basic tasks like emails, internet browsing, word processing, and spread sheets. Battery Life: Chromebooks generally have a good battery life and it is common to find Chromebooks with 8 to 12 hours of battery life. Unlike traditional laptops, there is no need for Microsoft Office, Antivirus and other software programs in a Chromebook. All that Chromebooks have in them is software to run Google’s Chrome OS and browser. Everything else lives on Cloud in the form of apps for documents, spreadsheets and other tasks. The basic idea behind Chromebooks is to run a web browser and connect users to Cloud based apps. Chromebooks entirely rely on Google’s Cloud based platform and Web applications to perform common computing functions like creating documents, working on spreadsheets, preparing presentation slides and so on. In comparison, regular laptops perform all their computing functions using on device resident programs and store everything on local storage. There is a common misconception that a Chromebook always needs to be connected to the internet. However, this is not entirely true; you can do a lot on a Chromebook while you are offline. Most people have grown up with Windows based computers and readily associate Microsoft Office programs with performing productivity tasks on a computer like creating documents and working on spreadsheets. Just to make you feel better, Chromebooks do support online version of Microsoft Office and you can make use of this to work on your documents and spreadsheets. Another option is to use Google’s suite of Microsoft Office like programs that are available for free on Google Drive. You can use Google Docs to work on Word documents, Google Sheets to create spreadsheets and Google Slides to create presentations. Here is a table that provides you a list of Microsoft Office programs and their Chrome equivalents. Hope you have learnt about Chromebooks and are itching to get one. Before you do so it is recommended that you learn more about Chromebooks by reading its advantages and disadvantages.